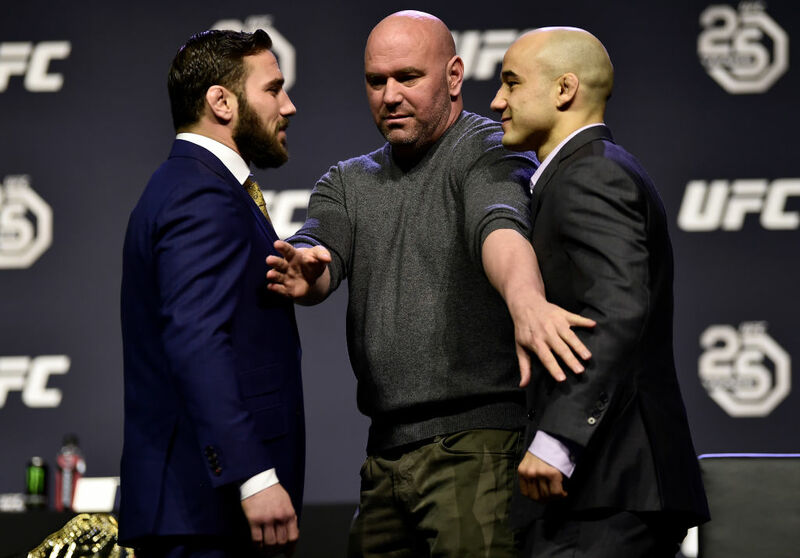 As the UFC embarks on its first trip to Utica, New York, a pair of top-ranked bantamweights are looking to get into title contention as Jimmie Rivera takes on Marlon Moraes in what should be an action-packed main event. Rivera has gone undefeated since joining the UFC roster, with several impressive wins, including victories over Thomas Almedia and UFC Hall of Famer Urijah Faber. Rivera has been knocking on the door for a title shot for the past year and he'll look to secure that spot with a win on Friday night. As for Moraes, he has won his last two fights in a row, including a jaw-dropping knockout against Aljamain Sterling in his last performance. Now Moraes will look to settle a long-standing grudge with Rivera when they meet in the main event. In the co-main event, highly touted prospect Gregor Gillespie will look to keep his undefeated record intact when he takes on Ultimate Fighter veteran Vinc Pichel, while veteran welterweights Jake Ellenberger and Ben Saunders will also clash on the main card. In today's fantasy preview, we're going to examine these fights and several more to see who has the edge and if there might be an upset or two on tap at UFC Fight Night: Rivera vs. Moraes. Yep, we're kicking things off with an upset right out of the gate in the main event. Now first things first, it's tough to look at this matchup with either fighter considered the favorite or underdog. That being said, the oddsmakers have instilled Rivera as a slight favorite in what should be an absolute battle with Moraes in this headline fight. So why is Moraes a good pick for an upset here? Well, Moraes and Rivera both carry a somewhat similar skill set, with each of them preferring a standup battle as opposed to a ground war. Both fighters like to push the pace for high output and lots of volume striking. The difference for Moraes here comes down to his diversity of striking as well as his knockout power. Moraes is a very active fighter on his feet with a kickboxing style, so he'll be throwing a lot of punches and kicks from the outside. Moraes is lightning quick, which helps him hit and then not get hit in return, which could be a valuable weapon in this fight. Rivera is best known for his incredible output, where he averages nearly five significant strikes landed per minute while also hitting the target over 40 percent of the time. Moraes is similar, but the Brazilian loves to cap off his combinations with a big power shot at the end and he only needs one of those to land to do maximum damage. Moraes is a very skilled striker, and if he can catch Rivera during those exchanges on the feet, he has a great chance to score a knockout or, at the very least, a knockdown. Moraes keeps a blistering pace but can also settle into a rhythm on the feet that's tough to deal with at times. Moraes is best when he's got a willing opponent who will engage with him and that definitely describes Rivera. That's why Rivera's tendency to step forward with his combinations makes him susceptible to Moraes' power punches and kicks. Moraes may not get the finish but he'll dish out enough punishment over five rounds that it should be enough to secure him the victory. Of course, Rivera has pulled off more than a few stunning wins since joining the UFC roster, so don't sleep on him as the favorite. Still, Moraes' ability to mix up his strikes with a diverse arsenal of weapons combined with serious knockout power make him a good pick as an upset in the main event. A pair of true Octagon veterans will square off at the UFC Fight Night card in Utica as Jake Ellenberger and Ben Saunders clash on the main card. Both fighters are coming off recent losses, so it's definitely an important fight as Saunders and Ellenberger look to get back on track. Ellenberger packs a serious punch while also possessing solid wrestling, as he averages more than two takedowns per fight. Ellenberger's ability to mix things up will be a key asset for him in this fight, as he'll look to keep Saunders guessing on the feet or on the ground. Ellenberger will also need to find a way to get inside, as Saunders will employ a massive six-inch reach advantage in this fight. Saunders will look to use that size and reach to overwhelm Ellenberger on the feet, where he has some of the nastiest Muay Thai elbows and knees in the business. Saunders is a master at grabbing onto the Thai clinch and then battering his opponents with knees on the inside. Saunders is also comfortable on the ground, especially if he's able to employ his rubber guard game from the bottom with a variety of submissions at his disposal. Where Saunders has to be careful is during those exchanges on the feet when he's winging punches with Ellenberger. Each fighter has the ability to knock the other one out, but Ellenberger is better known for that one-punch power that can put your lights out in a hurry. Saunders tends to get drawn into those epic slugfests, and it could cost him in a major way if he's not careful against someone as dangerous as Ellenberger. If Saunders can avoid that big shot, he's got more than enough ability to push the pace, land a volume of strikes and potentially earn a TKO or submission of his own. The key is weathering the storm and, unfortunately, in his most recent fights, Saunders has not been able to avoid that damage so that's why Ellenberger remains a slight favorite to get the job done in this matchup. It's far from a lock, however, so don't be shocked if this one ends up as the Fight of the Night in Utica. A key fight in the women's flyweight division will cap off the preliminary card as former Ultimate Fighter housemates Sijara Eubanks and Lauren Murphy will clash, with the winner likely sitting awfully close to a title shot. Eubanks will be making her first appearance after a bad weight cut cost her a shot at the inaugural flyweight title last year when she was scheduled to meet Nicco Montano at The Ultimate Fighter Finale. When she was performing on the show, Eubanks was a force of nature thanks to a powerful grappling game coupled with devastating power on the feet. Eubanks was definitely one of the bigger fighters in the house and she will maintain that size after spending most of her career fighting as a bantamweight. Eubanks has also been training non-stop under head coach Mark Henry, who is the same mastermind behind fighters such as Frankie Edgar, Eddie Alvarez and main event fighter Marlon Moraes. Eubanks is a powerhouse and she will certainly look to employ that strength while going up against a more experienced opponent on Friday. Murphy is an Octagon veteran who had several battles at bantamweight before dropping down to a more natural 125 pounds to compete on The Ultimate Fighter. Murphy is a very strong grappler with good wrestling and ground control. Murphy is scrappy on the feet as well but she'll probably look to avoid the power punches coming from Eubanks in this fight. For Eubanks, the key will be mixing up her attacks with a variety of striking combinations and takedowns that may throw Murphy off her game. Murphy is typically the stronger wrestler, so being forced to defend takedowns could result in Eubanks being able to score more on top while using forward pressure on the feet. On the flipside, Murphy needs to push a serious pace to see how Eubanks' conditioning will be after a struggle to make weight in her previous fight. Murphy is definitely capable of having thrilling performances, but she's also well versed at slowing down the action and grinding her opponents on the mat if that's what it takes to get the win. In a real toss up, the slightest edge goes to Murphy, who has been in these kinds of positions before with her previous Octagon experience. Eubanks looks like a serious prospect, but it's tough to know what to expect after her weight cutting woes the last time and that’s why it's a little harder to pick her to win here. Another barnburner fight on the main card will see Gian Villante take on Sam Alvey, who makes his second appearance in the UFC's light heavyweight division. Alvey had bounced back and forth between wins and losses at middleweight but ultimately decided to test the waters at 205 pounds in his last fight and it paid off. Alvey has incredible knockout power and he's not afraid to throw hands with anybody willing to stand with him. Alvey isn't the slickest striker and he won't blow anybody away with his technique, but he's well versed in those massive power punches with solid boxing to back him up. Now it's not likely that Alvey will suddenly start throwing a lot of kicks or even try for a takedown, but he certainly knows how to pour on the pressure on the feet with his boxing. As for Villante, he's a bit of a wild man whenever he steps into the Octagon, as he usually starts strong with an offensive output that's nearly unmatched in the UFC's light heavyweight division. Villante has a ton of power behind his strikes and he will enjoy a size advantage with about an inch of reach on Alvey. The real problem that Villante has faced in the past is his woeful defense. Villante absorbs nearly six significant strikes per minute and that's the worst possible defense against a fellow power puncher in Alvey. Alvey is confident enough in his boxing to step forward on a strong opponent like Villante and as long as he can endure that first-round flurry, he has a great chance to power back to pull off the knockout in round two or three. Gregor Gillespie continues to be one of the best prospects on the entire UFC roster while quietly tearing through his competition in the lightweight division. Gillespie has won his first four fights in the UFC, with three of them coming by way of knockout or submission. Gillespie is also a four-time All-American wrestler with a national championship under his belt as well. Now Pichel will certainly offer Gillespie his toughest challenge to date, as the former Ultimate Fighter contender has won four fights in a row while continuing to climb closer to the top 15 rankings in the lightweight division. Pichel is a pressure fighter who loves to throw big bombs while trying to knock out his opposition. Pichel is also no slouch on the ground, where he's actually averaged just over five takedowns per 15 minutes spent inside the Octagon. That being said, Gillespie will have the superior wrestling, ground control and power when these two lightweights clash in New York. Gillespie is a monster on the mat and he might just have an argument as the strongest wrestler in the lightweight division, and that's saying a lot considering the champion is Khabib Nurmagomedov. Gillespie is masterful at setting up his takedowns and then doing maximum damage once he gets the fight to the floor. Pichel will be tough in every exchange, but over time, Gillespie's ability to drag him to the mat and then begin punishing him with punches and elbows will mount a lot of damage from round to round. Gillespie is a name to watch as a future title contender and this should be another showcase for him in the co-main event. When it comes to heavyweight fights, all bets are usually off because one shot can quickly change the complexion of any matchup. That being said, in a showdown headed for the UFC Fight Night card in Utica, Walt Harris would appear to have the athletic advantage over his opponent Daniel Spitz. At 6-foot-7, Spitz is going to be a long rangy striker against almost anybody he faces short of a matchup against Stefan Struve, but he'll be giving up a lot of one punch power against somebody as dangerous as Harris. Spitz has won the majority of his fights by decision and he's currently averaging around two takedowns per 15 minutes in the Octagon, so that is definitely a weapon he might want to use in this matchup. Harris is a dynamic knockout striker with devastating power in both hands as well as underrated kicks that can definitely do some damage as well. Harris is actually pretty active on his feet at all times, landing with solid volume, but his best offense in this fight might be Spitz's lacking defense. Spitz is absorbing nearly six significant strikes per minute through two fights in the UFC, and that could be his downfall against someone as dangerous as Harris on the feet. Spitz can take a lot of punishment and keep coming forward, but he's also facing arguably the biggest puncher he's ever seen in his professional career and that's a major risk to take going into a fight like this. If Spitz can't get this to the ground early, look for Harris' confidence to grow until he puts together the winning combination to get the knockout. Belal Muhammad will look for his fourth straight win as he takes on late notice replacement Chance Rencountre this weekend in Utica. Rencountre comes to the UFC with an impressive 12-2 record fighting out of Alliance MMA, which is the same gym responsible for former bantamweight champion Dominick Cruz and current featherweight contender Jeremy Stephens. Rencountre has won four fights in a row and holds a victory over UFC veteran Jake Lindsey during that streak. Rencountre definitely has knockout power in his hands, but he's also not afraid to go to the ground, where he's wrapped up submissions in his past two victories. Rencountre seems like he could be a solid prospect for the future, but he's definitely fighting an uphill battle against a surging welterweight like Muhammad. Muhammad has really started to hit his stride late with impressive wins over Randy Brown, Jordan Mein and Tim Means. Muhammad is extremely well rounded, landing nearly five significant strikes per minute on the feet and mixing in more than two takedowns per 15 minutes in the Octagon. It also can't be discounted that Muhammad has that UFC experience, which can be so valuable, especially when taking on a late notice newcomer like Rencountre. Rencountre will make a showing for himself, just based on his skill set and the kind of team he has around him to get ready for this fight. But Muhammad has been poised for a run at the top 15 and unless he's somehow looking past Rencountre in this fight, he should be able to control the pace, land his strikes, mix in some takedowns and look for the finish against the UFC rookie.